For more information on our publications and copies of some of the books, reports or articles we have produced and which reflect the scope of our work please select from above. Some publications are in PDF format. If you need a small free PDF reader, please click here for the FoxIt PDF Reader. This factsheet provides gender specific policy data as it relates to older women. The main themes addressed are Health, Income, Employment and Risk of Poverty, Housing, and Access to Transport and Information. General information on older women as well as an overview of relevant government policies and programmes are also provided in the report. This report documents the journey of two communities, one on each side of the border, as they completed thirteen years of a cross-border peace-building initiative. The research provided a place for people in Riverstown and Brookeborough to tell their stories. It also analyses the value and experience of this cross border project. This report is the final one in a three part series which documents the experiences of minority communities in the North of Ireland. ‘As long as you gel in...’ provides an insight into the daily experiences of recently arrived migrant workers, long term members of ethnic minority communities and members of the Travelling Community in Co. Fermanagh. This audit provides a statistical overview of women in rural society in the North of Ireland. It presents information on where women are placed in terms of decision making which affects rural communities and within rural communities. Areas examined within the audit include employment, political representattion, local government, rural development, education, health and social services, local development, sport, cultural and special interest organisations. General information on women in rural Northern Ireland is also included. This study was produced to provide information on the position of women and men in Co. Fermanagh in decision making, employment, the community and voluntary sector and other key agencies. The study was conducted as a baseline for the development of a gender equality strategy for the county. Crawley M (2005) ‘Stepping out as equals: Fermanagh Gender Equality Baseline Study’ Published by and copies available from the Fermanagh Women’s Network, Enniskillen, NI. This report is the second in a series which sought to document the experiences of minority communities in the North of Ireland. Five council areas in counties Antrim and Down were involved in the research. This research report presents an audit of gender representation on decision making bodies in the North of Ireland and the six border counties of southern Ireland. The report also contains a brief overview of gender mainstreaming as a response to gender inequality. Crawley M & O’Meara L (2005) Balances along the border: a gender audit in Northern Ireland and the six southern border counties. Published by WEFT and available from the WRDA, Belfast. This Handbook was produced by the Gender Equality Unit within OFMDFM to assist government departments to carry out a gender impact assessment on their policies to ensure that women and men are presented with equality of opportunity in relation to all policies and programmes. This handbook was developed to assist community and voluntary sector organisations in the development and implementation of a gender equality policy. It is aimed at staff, volunteers and management committee members of community and voluntary groups, projects and organisations and can be used by any group regardless of size or area of activity. It outlines a straightforward process towards developing a policy that sets out how you can promote gender equality in your organisation or group and what practical steps you can take to implement it in practice. The report presents findings from research which looked at the links between homelessness and drug use, considered local service providers' policies and practices in relation to these issues and examined the experience homeless drug users have of homeless services. It involved interviews with homeless drug users and service providers in the greater Tallaght area of Dublin. It also explores the reasons behind their homelessness; examines the policies and practices of local authorities in relation to the housing of homeless drug users; and explores the experiences of homeless drug users with special reference to the policies and practices of homeless services. Primary among the recommendations made by the research is the need to recognise the links between homelessness and drug use at policy and service delivery levels. Crawley M & Daly M (2004) 'Heroin - the Mental Roof over your Head - Links between Homelessness and Drug Use'. Published by and available from the Tallaght Homeless Advice Unit, Dublin. This action research was aimed at firstly, identifying the needs, concerns and issues facing minority Protestant communities living in the border area and secondly examining the reasons for low uptake of the Peace and Reconciliation Programme by these communities. It involved facilitating, analysing and documenting two workshops in each of the four selected communities and identifying recommendations which would enhance uptake of Peace II by Protestant communities. Crawley, M (2003) 'You feel you'd have no say - Protestant Communities in Border Areas', Published by and available from the Rural Community Network NI. The Gender Proofing Handbook was produced to provide information and practical assistance to those planning to gender proof strategies or development plans. The Handbook provides (1) an introduction and background information on the issue; (2) outlines why gender proofing is needed, and (3) suggests how to apply the gender proofing process to objectives and actions. Crawley, M & O'Meara, L (2002 )'Gender Proofing Handbook', published by and available from the NDP Gender Equality Unit, Dept. of Justice, Equality & Law Reform, Dublin (written in both Irish and English). This factsheet considers some general issues in relation to refugees and asylum seekers, outlines some gender issues in work with refugees, presents case studies of good practice and suggests actions which could be implemented by agencies and organisations working with refugees. This factsheet was researched and produced as part of a series commissioned by the NDP Gender Equality Unit to assist agencies and organisations responsible for the implementation of the National Development Plan. Crawley, M & O'Meara, L (2002) 'Gender Equality and work with Refugees', published by and available from the NDP Gender Equality Unit, Dept. of Justice, Equality & Law Reform, Dublin. This factsheet highlights gender equality issues in the area of community development and in local and community decision making structures. It presents models of good practice, both national and international and suggests actions to promote gender equality in the area of community development. The factsheet was researched and produced as part of a series commissioned by the NDP Gender Equality Unit to assist agencies and organisations responsible for the implementation of the National Development Plan. Crawley, M & O'Meara, L (2002) 'Gender Equality in Community Development', published by and available from the NDP Gender Equality Unit, Dept. of Justice, Equality & Law Reform, Dublin. This factsheet outlines the background to the emergence of the Peace Programme, highlights gender equality issues in the delivery of Peace II, presents examples of good practice from Peace I and other international conflict situations and suggests possible actions to promote gender equality. The factsheet was researched and produced as part of a series commissioned by the NDP Gender Equality Unit to assist agencies and organisations responsible for the implementation of the National Development Plan. Crawley, M & O'Meara, L (2002) 'Gender Issues in the Peace and Reconciliation Programme (Peace II)', published by and available from the NDP Gender Equality Unit, Dept. of Justice, Equality & Law Reform, Dublin. This article, published in a Network News edition that focused on the theme of governance briefly examines Section 75 in terms of its contribution to enhancing the role of women in governance in Northern Ireland. “If it is good to empower women in 1998, why is it not in 2003”? This article is a response to the Task Force position paper on resourcing the community and voluntary sector (entitled Pathways for Change). This response is from the perspective of the rural women’s sector and highlights the need for the critical role of the sector in affecting social change to be taken into account. Crawley M (2004) ‘If it is good to empower women in 1998, why is it not in 2003’? Network News 38 12-15. Published by and available from the Rural Community Network NI. This paper was published in one of a series of strategy guides aimed at assisting community groups to translate mainstreaming theory into practical actions and to examine various strategies for mainstreaming. The paper outlines the experiences of a rural women's network in the North of Ireland in developing and negotiating an effective gender mainstreaming agenda. In particular, it describes practical actions undertaken, elements of good practice and highlights challenges and concerns around the implications for gender specific work. This article provides an insight into the nature of local development work with rural women in the North of Ireland and outlines the benefits of this work to rural communities. This paper outlines the effects of the EU Peace and Reconciliation Programme on the development of rural women's groups. It raises questions around the sustainability of these initiatives and outlines a challenge for Phase II of the EU Programme. It also examines ways in which District Partnerships could adopt a strategic and inclusive approach to gender in their work by suggesting practical gender proofing actions. Crawley, M. (1998). ‘Networking with Rural Women’s Groups and Linkages with the Peace and Reconciliation Programme’, in Local Development in Ireland - Policy Implications for the Future, Community Workers Co-operative. This article considers some of the issues which emerge in linking local community based women's development to initiatives which pursue a policy agenda and in particular, it examines the challenge in linking local rural women's development to the wider rural development agenda. Crawley, M. (1998). 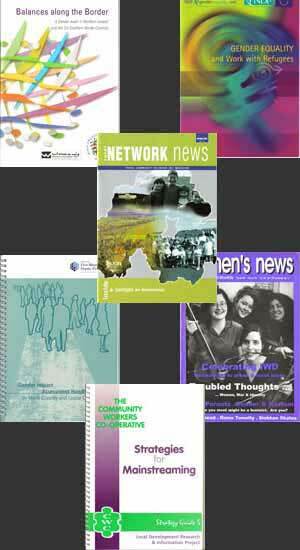 ‘Women’s Networks - the emerging voice in Rural Communities II’, Women’s News, Belfast. This paper explores the position of women's studies in a community education setting, and in particular explores the factors which contribute to many women's reluctance to engage in this area of study. Recognising its importance in raising critical awareness of gender issues at a local level, this paper suggests ways in which women's studies could be made more appealing to the majority of women. Crawley, M. (1996). ‘The Reality of Women’s Studies in Community Based Education’ in ‘ Feminism, Politics, Community’,Ed., Ailbhe Smyth, Women’s Education Research and Resource Centre, University College, Dublin.